After the theatrical, cinematic and stylistic overload of The Red Shoes (1948), Powell and Pressburger retreated into the hemmed in spaces and cloying domestic intimacy of The Small Back Room. In many respects, the film seems like an antidote to the previous work, a return to the smaller scale wartime projects that marked the start of their collaboration. Nevertheless, and despite its many connections to Contraband (1940), which features a similar fixation on the experiential conditions of blacked-out London, The Small Back Room very much reflects the moment of its production, evoking the feeling of austere, ration-dominated and bureaucracy-driven Britain in the late 1940s. The film has also often been compared or linked to the cycle of films noir common to both American and British studio production at this time. This is predominantly a result of the film’s visual style – all shadows, dingy interiors, vast but still enclosing exterior locations – as well as its preoccupation with a psychologically, physically and thus sexually scarred male protagonist, damaged by his active war service. So unlike the emotionally and cinematically expressive realms of A Matter of Life and Death (1946), Black Narcissus (1947), and The Red Shoes – where characters are infected, even elevated by their actions and surroundings – The Small Back Room is a much more sombre affair, less an excessive dream or nightmare than a moving, quotidian, lyrical awakening. Many of Powell and Pressburger’s films fixate upon dysfunctional, sometimes stunted but still Romantic central characters, “artists” or impresarios who are driven by an excessive or peculiarly interior vision of the world. This “vision” often requiring their separation or exile from the community they wish to belong to, and often help define. This is a key reason why their films (including Powell’s solo work) are crowded with representational devices and apparatuses for seeing (1), as well as characters who offer a rarefied and combinatory vision of society, community and the land. These characters often fly solo – literally so in the opening of A Matter of Life and Death – and the films’ narratives often revolve around whether they can be brought back to earth, their idealistic vision combined with a more earthy (and truly social) existence or reality. Although in some ways The Small Back Room can be seen as a departure from this model, it can also be regarded as the last, small-scale variation upon this theme (which does pop-up again in a much less traumatic and fully engaged fashion in both of Powell’s Australian productions, They’re a Weird Mob, 1966, and Age of Consent, 1969). Bomb-disposal expert Sammy Rice’s (David Farrar) control of his surroundings is much more obviously solipsistic and localised than Colpeper’s in A Canterbury Tale or Dr. Reeves’ in A Matter of Life and Death, but the narrative’s journey or arc still involves his re-emergence into society, and his emergence from the “small back room” that encloses equally his damaged mind and body. Unlike the more ecstatic traumas of the past that mark the visionary characters of The Edge of the World (1937), A Canterbury Tale, Peeping Tom (1960) and Black Narcissus (for example, Sister Clodagh’s deeply hued flashback memories of a verdant Ireland), Sammy’s trauma seems more mundane, understandable, an obstacle (he has an artificial leg that gives him considerable pain and discomfort) that time will help heal. But the film is more mysterious and “clipped” than I’m letting on. We actually find out very little about Sammy’s past or the specific event that led to his trauma. Despite the fact that very little of the film moves outside of Sammy’s immediate perspective and perception, it also strives to avoid most overt representations of his subjectivity. It is perhaps possible to read the encroaching shadows and stunted, boxed perspective of the film – as well as its “return” to black-and-white (2) – as reflecting something of Sammy’s consciousness, but the film mostly places him within objectively rendered environments, and makes us try to comprehend both the physical reality and ultimate unknowability of his emotional life. One of the most remarkable aspects of The Small Back Room is its rendering of space and place. Powell and Pressburger’s films are littered with moments where characters become aware of and then embrace their environments, often featuring majestic shots of figures dwarfed by or silhouetted against vast, often craggy landscapes. This film features such landscapes – or at least the suggestion of them – but represents them in an uncharacteristic fashion. Although it is often sparse in its composition, The Small Back Room comes across as the most crowded and claustrophobic of their works (though parts of The Tales of Hoffmann, 1951, challenge this pre-eminence). This is unsurprisingly true of the hearth-like interiors of Sammy’s apartment, but it is also an approach that is carried over into the natural landscape. An early scene features Sammy visiting Stonehenge for the testing of a new weapon. Despite the open and desolate setting, few shots in this scene give any sense of the vastness of the surroundings, or the sentinel-like qualities of the stones. This has much to do with the way in which cinematographer Christopher Challis frames both characters and their surroundings. Many of the shots in the film, and this scene, are closely cropped, with objects and characters’ bodies/faces extending into the off-screen space. Stonehenge doesn’t really appear as a singular entity, the immediately familiar arrangement of stones in the middle of a vast plain we are so used to seeing, but rather as a collection of overbearing and somewhat random monoliths. In contrast to almost all the exteriors of films like A Canterbury Tale or I Know Where I’m Going! (1945), it has nothing mystical about it. The film uses one of the most resonant symbols of British or Celtic mysticism as little more than a strange, arbitrary backdrop; a forbiddingly vast but still boxed-in exterior environment that both overwhelms and constricts Sammy. Little is even made of the looming shapes of the stones, surprising considering the teasing proliferation of large and small cylindrical shapes and volumes that litter Sammy’s immediate surroundings (including the booby-trapped bombs that the Germans drop from the sky and which Sammy has to disarm), constantly reminding him, and us, of the dipsomania he is fighting against. This rendering of space is furthered by the film’s consistent deployment of specific types of mobile framing; short lateral tracking movements that act to both move us through space and suggest its limitations (it is contained, blocked by walls or just the circumscribed movement of characters). In Contraband, the inky space of blacked-out London is open to the clandestine excitement and sense of encounter characteristic of the early war period. The Small Back Room‘s blackout is more tawdry and mundane, a constant reminder of the bureaucratic and quotidian dimensions of daily life (and this is a rare film to focus on the unexceptional aspects of wartime conditions, other than in regard to their effect on some aspects of sexuality, human encounter and daily routine). Many of the scenes featuring characters venturing out into the London night have a feeling of desperation about them, a quietly over-expressive dimension contrasted to the cloying cosiness of the domestic interiors (of apartment, laboratory, restaurant, etc.). But this is also an unusual war-themed film in that most of the conflict and tension are generated internally or between characters – the only real evidence of the enemy are the mysteriously shaped, booby-trapped bombs strewn almost absent-mindedly over the countryside. The Small Back Room is most often celebrated for its bravura penultimate scene, where Sammy finally gets to tackle one of the bombs and proves himself physically, emotionally and even “artistically” capable (the intricacy of his work on the bomb is central to this). It is also revealing that this is the first time in the film where the landscape really opens out, pitting Sammy against a bomb wedged into the treacherous pebble beach of wind-swept Chesil Bank, Dorset. This scene combines both an extraordinary tension and a matter-of-fact dissection of war-time routine. Although it is often claimed as an underrated Powell and Pressburger film (and rightly so), The Small Back Room has received little sustained critical attention or re-evaluation. Powell’s discussion of the film in the opening section of Million-Dollar Movie both elevates the film – he sometimes called it his favourite of his own works – and reveals a little discomfort about its expressively sombre minimalism: “I saw the film through more than thirty years later at the New York retrospective’s showing of my films, and found this particular movie a cold one” (3). 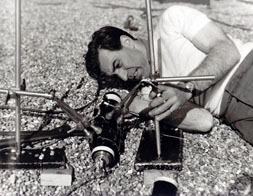 A significant exception to this lack of critical attention is Raymond Durgnat’s often-astute and detailed analysis in Ian Christie’s seminal Powell, Pressburger and Others, focusing on the various contexts the film should be placed within and the palpable “congestion of atmospheres” it evokes (4). Durgnat’s rumination is particularly valuable for how it hones in on the prevailing mood and temperature of the film; a wintriness that, despite the director’s subsequent reservations, makes this one of Powell and Pressburger’s most soulful works (in this regard it has certain correspondences to Black Narcissus, also featuring a tortured David Farrar and Kathleen Byron in somewhat opposed roles). The Small Back Room is also remarkable for its rendering of the frank and obtuse romance between Sammy and Sue (Kathleen Byron). As Powell has suggested, this is amongst his most intimate and close-up films. The discussion of space above indicates how this is achieved and reinforced visually, but the cosy and sometimes lacerating intimacy of the film is also propelled by the pictorial dominance of close-ups and mid-shots of objects and characters’ faces. Although the film is marked by Sammy’s perspective and experience – for example, we never venture into Sue’s apartment which is just across the hall – it is equally concerned with the physical and mental relationship between the central characters. As Powell has suggested, “Kathleen is a close-up girl…. There was the deep, withdrawn personality and the luminous eyes.” (5) In this typically admiring portrait of his sensual female star, Powell pinpoints the film’s ultimately mercurial qualities. The Small Back Room is a subtle, somewhat indescribable (perhaps one reason for the lack of critical discussion) but inexplicably emotional work. It is a complex film that contains whole worlds of feeling and experience that we only ever really see or feel the tip of; see, for example, the scenes with the young fuse expert, intimately played by Cyril Cusack, whose difficult home life acts as both fascination for and warning to Sammy. Nevertheless, it is also a film that is surprisingly upfront about much of its tortured sexuality and neuroses; Sammy does not shun Sue or the bottle, but rather gathers each close to him, testing both his resolve and emotional temperature. For a film superficially concerned with the “art” of bomb disposal and the role of science in the bureaucracy of warfare, The Small Back Room is a surprisingly intimate and even domestic work. Despite the sombreness of many of its scenes – and the expressionism of its most derided sequence featuring Sammy’s battle with a nightmarishly outsized and multiplied bottle – it finally emerges as one of Powell’s most optimistic works, a rarity in his best British films after A Matter of Life and Death. The Small Back Room‘s final moments suggest the possibility of togetherness, a return to order and routine made all the more resonant by the simplicity and subtlety of the advances it claims. See Adrian Danks, “The Director as Peeping Tom: A Matter of Life, Death and Cinema”, Senses of Cinema; Great Directors Database 2002. This was Powell and Pressburger’s first film in black-and-white since I Know Where I’m Going! Following the Technicolor experiments and extravagances of the previous three films, its choice of black-and-white seems very much related to the tone, mood and period setting of the film. The filmmakers worked in black-and-white only once more, on the similarly moody and war-themed Ill Met by Moonlight (1957). Michael Powell, Million-Dollar Movie, Mandarin, London, 1993, p. 15. Raymond Durgnat, “On The Small Back Room”, Powell, Pressburger and Others, ed. Ian Christie, BFI, London, 1978, p. 76.